“I always knew you were a C sharp,” Gherald chuckled as Christopher looked at his card. Stuart Paul Duncan, the course instructor, had distributed large hand-written cards to the inmates, each labeled with a different pitch in the chromatic scale. It was our second month teaching music theory and appreciation at Auburn Correctional Facility, one of New York State’s largest all-male maximum-security prisons. Claire, my fellow TA, watched with apprehension as chatter broke throughout the classroom. Though Stuart had told Claire and me his plan during the car ride to the prison, neither of us was sure it would work. Laughter and relief swept through the room. The men gladly rose from their individual desks and gathered towards the back of the room where there was space to move. “Look! I’m next to you!” Gherald called to Christopher as he held up his own card, which had a big letter D written in marker. Stuart, Claire, and I had been struggling to communicate basic concepts of music theory to these seventeen men with vastly different levels of education. Our only tools in the prison classroom were a rickety chalkboard on wheels that moved every time you wrote on it and a small electric keyboard which, while helpful, was difficult for the entire class to see at once. We hoped that the “human piano” would enable the students to better visualize major and minor scales, bringing the keyboard to life. On one side of the lineup, near B-flat and A, the inmates were laughing while David held up his A-flat card as if he were posing for a mug shot. He turned left; then right, his face expressionless as the men around him roared with laughter. Claire and I had cards as well, and we took our places beside the men. I stood next to Shane and he inched cautiously away from me, avoiding eye contact. I held up my E, realizing with a jolt that I was standing next to a man who had committed murder. It was shockingly easy to forget, in the midst of the classroom environment, that the majority of the students were serving life sentences for committing horrendous acts. I reminded myself that I was not there to treat or regard them as criminals. My goal was to share the joys and mysteries of music making, to try to understand their need for creative expression and, in turn, gain insight into my own personal and artistic motivations. The energy in the room crackled and it was clear why. In music class, these men were able to temporarily change their identity from prisoner to student, from being numbered to being human. Music became a life force, providing vital human connection in an environment where social interaction is suppressed. The classroom provided a safe haven, enabling the inmates to engage with each other in a positive way, to explore and experiment with feelings of normalcy and inclusion, feelings that are alien to incarceration. “Who belongs to a D major scale?” Stuart asked. Little by little, the men stepped forward, helping each other as they counted whole steps and half steps. F sharp and G flat debated who should be part of the line. Stuart’s undoubtedly risky pedagogical experiment paid off. The students actively engaged in a constructive, educational game instead of passively accepting information recited from the front of a classroom. They took their learning experience into their own hands. More importantly, Stuart appropriated an aspect of prison culture and transformed it into a positive experience. Yet he was simultaneously challenging the prison environment by allowing the inmates to take charge and solve a collective problem. The exercise implicitly questioned the inmates’ sense of their own identity—as individuals and as a unified whole. The “human piano” proved to our students that Stuart, Claire, and I accepted that we were not simply in a classroom but deep inside prison walls. It showed that we were willing to stand beside them, aware of their crimes, yet still believing that the human need for education and artistic expression extends to those living behind bars. The lineup was no longer a threatening assembly of criminals but a team of individuals with the potential for creativity and growth. Though Stuart never explicitly communicated these intentions to his class, they understood. From that point on, there was a shift in the atmosphere. The tension broke. They began to trust and accept us, and we began to trust and accept them. 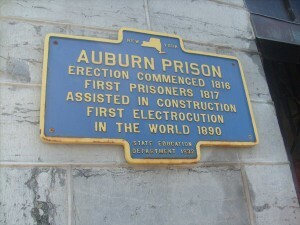 The inmates at Auburn sprang to life whenever we played music. The entire room pulsed with energy, excitement, and a thirst for culture and intellectual engagement. From the prison’s small boombox, we played Steve Reich’s It’s Gonna Rain, Benjamin Britten’s The Young Person’s Guide to the Orchestra, Olivier Messiaen’s Quartet for the End of Time, along with songs by the Beatles, Scott Joplin, Howlin’ Wolf, and T.I., to name a few. Stuart compared rhythms in Rachmaninoff to those found in salsa music. Britten’s music introduced the orchestra, revealing how instruments trade musical ideas. We discussed color and orchestration, form and motivic development. Stuart always found a way to relate the music to an aspect of culture familiar to the men in the prison. When we listened to Quartet for the End of Time, Stuart gave historical context, sharing that Messiaen composed the work in a German prisoner-of-war camp using the broken instruments available to him. The work premiered in 1941 for the inmates and guards outdoors in the rain. Our students were well aware that their situation was not analogous; they were in prison for crimes consciously committed. Yet, the story served its purpose. It allowed the inmates to imagine music flourishing in the stifling prison environment. It demonstrated that the creative spirit lives on in the face of dehumanization, incarceration, and fear. The story granted immediate access to the music. My students were completely immersed in the musical experience. Listening allowed them to relax and be moved by what they heard. They let down their guards and open up to each other. While listening to Rachmaninoff’s Prelude in C-sharp minor, the men closed their eyes and swayed from side to side. They tapped their feet to the beat or conducted in time with their own made up patterns. Gherald announced that he had named Rachmaninoff’s piece “Spider Legs.” Michael said that it reminded him of how an autistic person is shut off from the world, desperately trying to communicate. For him, the music captured the frustration of a person unable to reach or be understood by fellow human beings. In essence, it captured life in prison. My initial fear that classical music would somehow be alien to these men quickly evaporated. They felt it spoke to them directly and they quickly read themselves into the music. Many of the students described what they heard in terms of an emotional narrative, inventing a story that corresponded to the music’s building of tension and release. Stuart would then translate their observations about dramatic development into musical terminology. My students began to recognize recurring motifs, struggling to understand how a musical line simultaneously sounded the same and different. This was fascinating to them, and I felt their excitement as they strived to articulate compositional techniques. Seeing Stuart play our little classroom keyboard proved thrilling to these men who were starved for culture. Their eyes would light up like they were seeing fireworks for the first time. Steve Reich was very popular. Stuart linked Reich’s manipulation of magnetic tape to practices of sampling found in rap music. He explained the source material for Reich’s It’s Gonna Rain, a speech given by an African-American Pentecostal preacher, which led to a fascinating discussion about the musical and rhythmic elements of preaching. We also taught the inmates to perform Clapping Music. As they struggled to master the different parts, Stuart reminded the students that this was a professional piece of music and that even paid musicians had to practice. He said that we had complete faith that they could perform the piece by the end of the semester. I remember that day; Stuart, Claire, and I left the classroom feeling hopeful. As we waited in the hallway for a guard to lead us back to the prison entrance, we heard our students inside practicing Clapping Music. They wanted to rehearse in the few minutes they had together before the guards would return to lead them back to their cells. Being in the room with these men as they listened to the music I love transformed my understanding of art. I witnessed how music sparks communication and openness among men who have lived in a world of violence. Love, warmth, and life filled a small room set inside a vast, cold, dehumanizing prison environment. Emotions ran so high with the exposure to music that they were tangible. Connection to art and to each other generated such a life force that it was physically apparent. Each day after teaching, I would return home exhausted, feeling that I had just experienced seventeen different therapy sessions, one for each of my students. Listening to music and sharing their beliefs proved so cathartic to these men to such an intense degree that it was infectious. Ultimately, I was encouraged and inspired. Teaching music in prison affirmed my belief that art is accessible to anyone if placed in a fitting context. All a listener needs is a way in, whether it is through the real-life events behind a composition, an imaginary narrative, seeing how instruments communicate, following how a motif transforms overtime, or understanding the composers’ aesthetic intentions. The experience of art needs to be personal. Music becomes accessible when we can project an aspect of ourselves into the work of art, whether we are conscious of it or not. Even if it is not an emotional engagement, but an intellectual or philosophical one, the music must resonate in some capacity with our thought process. Even if music pushes us, challenges us, or defies our very definition of art, it does so by speaking to us personally, by taking something we know and altering it dramatically. The inaccessibility of classical art is not an issue of intelligence but an issue of identity and means of exposure. Once we can identify, we can listen. Once we can listen, we can identify.